Paul Higbee, local historian, shared the story of "Governor Tom Berry, the Cowboy Governor 1933-1937" on Dec 5, 2017 with the Spearfish Area Historical Society at the Spearfish Senior Citizens Center. Paul Higbee wrote the book "South Dakota's Cowboy Governor Tom Berry: Leadership During the Depression" published July 10, 2017. As South Dakotans endured the Great Depression and the worst of the Dust Bowl, they elected a cowboy from Belvidere as their governor. Tom Berry rode in the 1902 cattle round up ordered by President Theodore Roosevelt and later was called "Cowboy" or by his first name in meetings with President Franklin Roosevelt. to win the Governorship and became the 14th Governor of the state by campaigning to the people. He would stop wherever there was a crowd, and then proceed to regale the people with stories and good jokes. Some compared him to the great Western humorist Will Rogers. 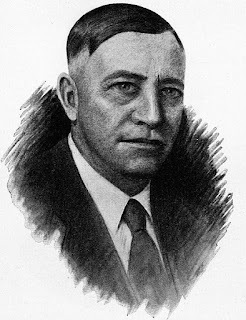 Of 31 Governors of SD, Tom Berry was only one of four from West River (west of the Missouri in the state). Paul Higbee's book is available and local bookstores and online. The Spearfish Area Historical Society normally meets on the first Tuesday of every month September through May; all meetings begin at 7:30 p.m. The PROGRAMS tab at the top of the page lists our 2015-2016 programs. Programs are held at the Spearfish Senior Citizen's Center at 1305 Tenth Street. Please check out the Programs Tab for details. We invite you to browse through our web site and photo galleries to learn more about our organization. And we hope to see you at our next meeting! Check out those family heirlooms! Click the Cakes to learn more! Deadwood archivist Runge recounts the history of old cannon and shell. Click on image to learn more. Photos of Sid's Halfway House? Click the Menu to help us find them!